Europe & the USA operate on different Frequencies or Bands. GSM 900 / GSM 1800 MHz are used in most parts of the world: Europe, Asia, Australia, Middle East, Africa. 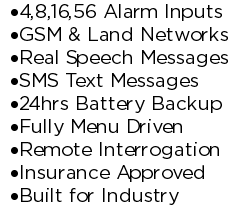 GSM 850 / GSM 1900 MHz are used in the United States, Canada, Mexico and most countries of S. America. A USA “Dual Band” Alarm Dialer or phone will not work in Europe, Asia, or Australia. A Europe “Dual Band” Alarm Dialer or phone will nor work in the USA, Canada or Mexico. A “Quad Band” Alarm Dialler supports the four main GSM frequencies so will work in both the USA and Europe.